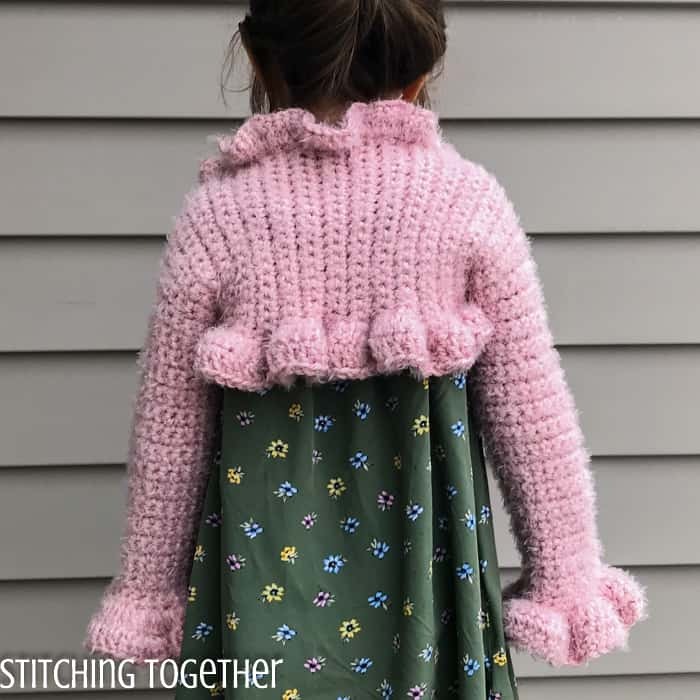 You’ve come to the right place to learn how to make a crochet bolero (crochet shrug) for girls! 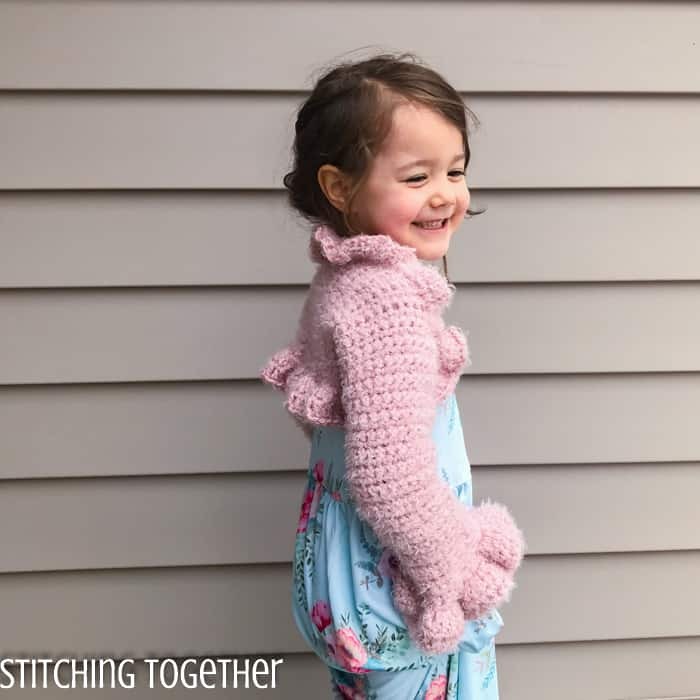 This adorable crochet bolero pattern can be found entirely for free below in sizes for 2 to 14 year-old girls. You can also purchase an inexpensive printable version of this pattern here. Don’t forget to save the free crochet bolero pattern on Pinterest! Do you ever find that you know a word but you aren’t sure why you know it and aren’t totally convinced it is the correct word? 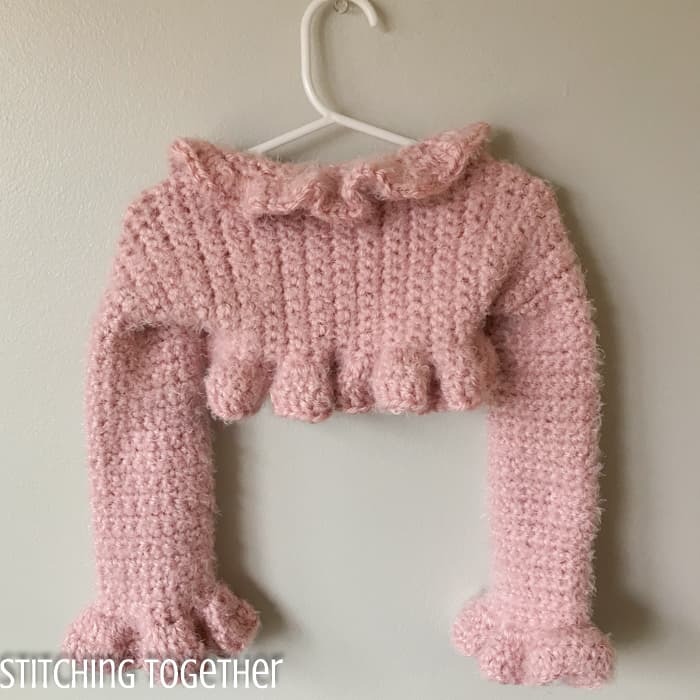 I’ve had the design for this crochet bolero bouncing around in my head ever since I made the Toddler Cocoon Shrug and it’s been called a “bolero” since then. But what on earth is a bolero and why do I know this word? Although the crochet version of the bolero isn’t cut in one piece, it is made in one piece! 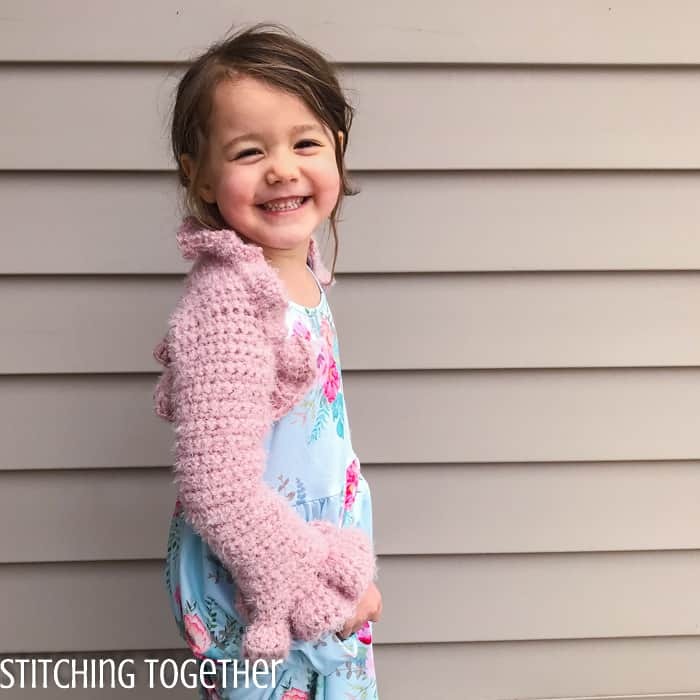 You just single crochet one long rectangle, do some simple sewing and you’ve made an adorable little crochet jacket! The ruffles are easy to add and take the cuteness up a notch. This amazingly cuddly and cozy bolero was made with Red Heart Hygge yarn. You can read more about what I think about this yarn in Luxury Crochet Scarf post. Since it is almost Easter time, I was hoping to create something that my favorite gal pal could wear over her Easter dress. 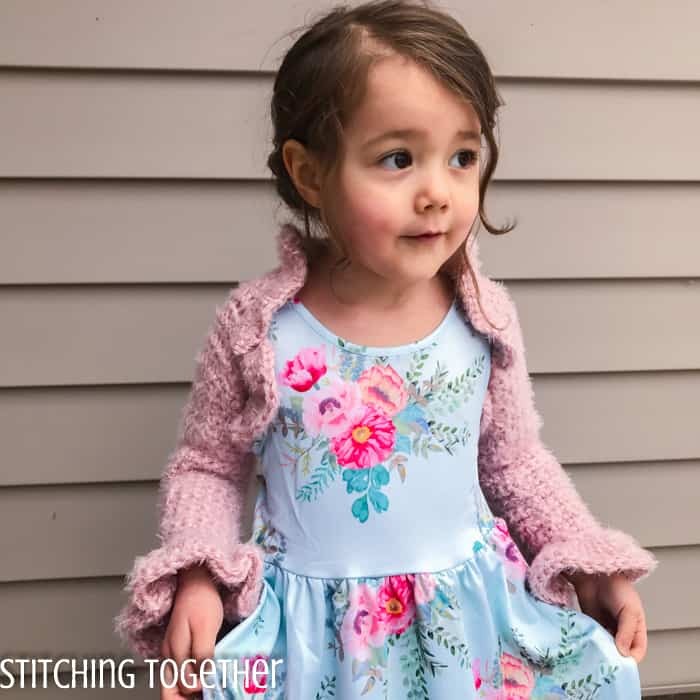 Little Gal Pal mentioned that the neighbors might think she’s a princess with her new dress and cozy bolero. We never know what the weather will be like here in MN. Last year we had a full out blizzard in April. This year it could be hot which means air conditioners will be running and it’ll be freezing inside. Who knows! Either way, she’ll be prepared with this warm crochet shrug which matches her new dress perfectly. Never mind that I ordered a size too large and she’ll really have to wait until next year to wear it. 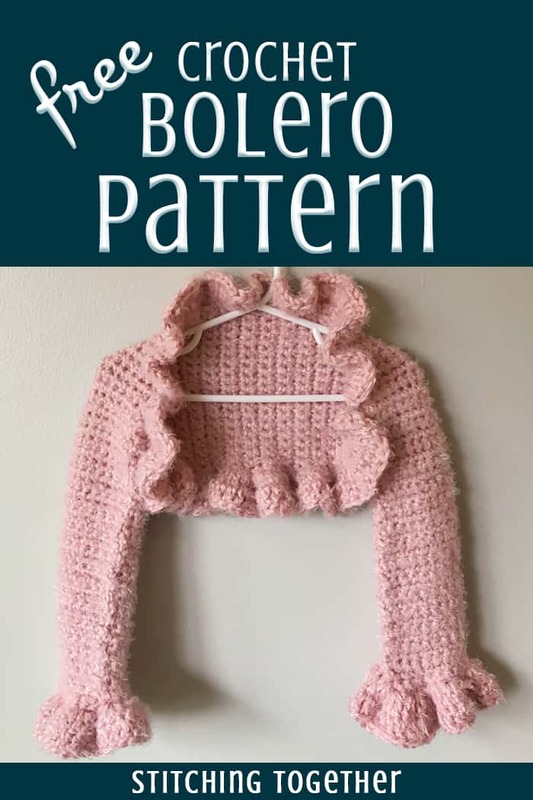 The crochet bolero is made by first crocheting a long rectangle then folding it in half and sewing inward toward the center, leaving an opening large enough to allow the bolero to be put on. The table below provides both the starting chain and row counts as well as measurements. If you are having a difficult time matching gauge, it may be easier to follow the measurements for the size you are wanting to make. 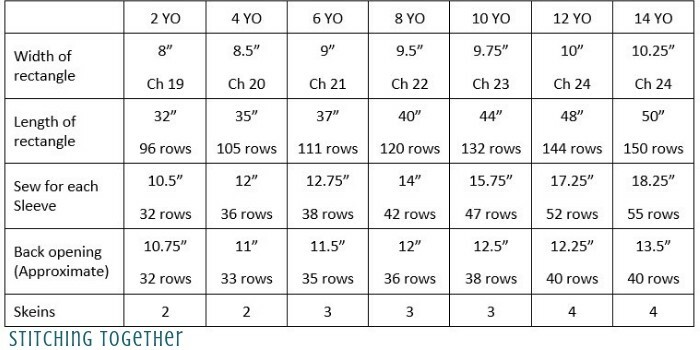 Sizes are written in the pattern for a 2-year-old with 4, 6, 8, 10, 12 and 14 in parenthesis. To further adjust the sizing or to ensure the best fit, there are three main measurements to take: the circumference of the upper arm, length across the body with arms held out – wrist to wrist, and the width across the back from shoulder to shoulder. The width of the rectangle is determined by the circumference of the upper arm plus one inch. The length is determined by arm length measured wrist to wrist minus 4″ to allow to the ruffles to be added. If you don’t want ruffles, add 4″ to the length of the rectangle. 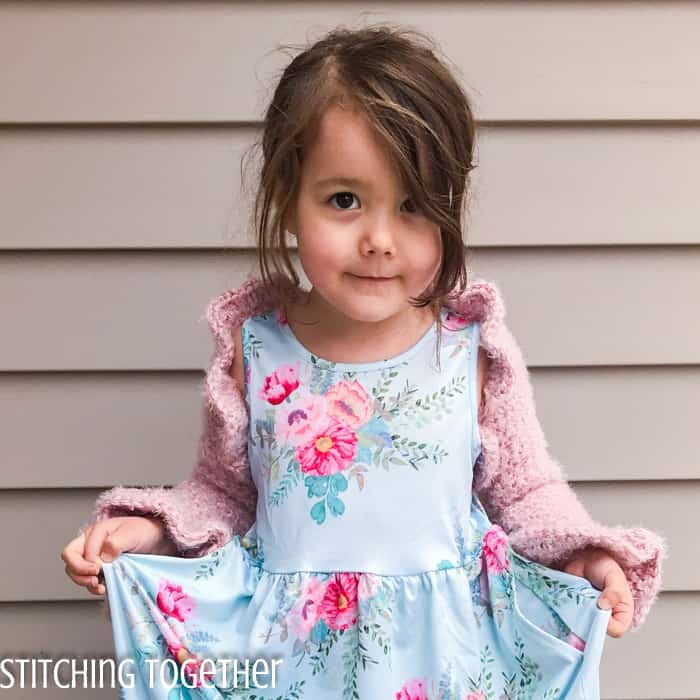 To make the shrug stay on and fit comfortably, the sleeves need to be sewn right up to the armpit, which allows the bolero to fit snugly across the back. Repeat Row 2 for a total of 96 (105, 111, 120, 132, 144, 150) rows. Round 1: Join yarn to any stitch on the cuff (outer edge) of the sleeve, ch 2 (counts as 1 dc), 2 dc in same st, 3 dc in each st around, join with sl st to the top of the ch 2. Round 2: ch 2 (counts as 1 dc), dc in each dc around, join with sl st to the top of the ch 2, fasten off. Join yarn on the right side of the opening, ch 2 (counts as 1 dc), 2 dc in same st, 3 dc in each st across, fasten off. Row 1: Rotate the bolero so the side without the ruffles is at the top and join yarn on the right side of the opening, ch 2 (counts as 1 dc), 2 dc in same st, 3 dc in each st across, turn. Row 2: ch 2, (counts as 1 dc), dc in each st across, fasten off. Round 1: Join yarn on the right side of the opening, ch 2 (counts as 1 dc), 2 dc in same st, 3 dc in each st around the entire opening, join with a sl st to the top of the ch 2. Round 2: ch 2 (counts as 1 dc), dc in each st across one side of the opening, fasten off.